Housing is an important source of economic growth. As of the second quarter of 2014, housing’s share of gross domestic product (GDP) was 15.5%, with home building and remodeling yielding 3.1 percentage points of that total. The first is through residential fixed investment (RFI). 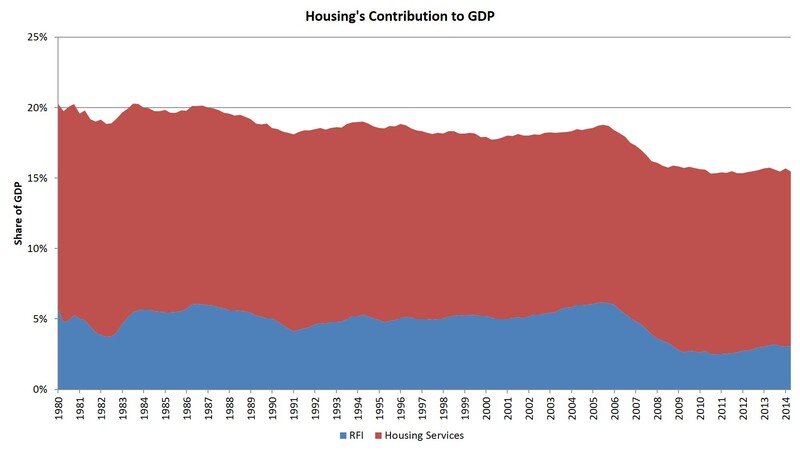 RFI is effectively the measure of the home building and remodeling contribution to GDP. It includes construction of new single-family and multifamily structures, residential remodeling, production of manufactured homes and brokers’ fees. For the second quarter, RFI was 3.1% of the economy. The RFI component reached a $496 billion annualized pace during the second quarter. This is the second highest quarterly total for RFI since the middle of 2008. Overall GDP expanded by 4.6% (annualized) for the quarter, with RFI adding 0.27 points of that total. The second impact of housing on GDP is the measure of housing services, which includes gross rents (including utilities) paid by renters, and owners’ imputed rent (an estimate of how much it would cost to rent owner-occupied units) and utility payments. The inclusion of owners’ imputed rent is necessary from a national income accounting approach because without this measure increases in homeownership would result in declines for GDP. For the second quarter, housing services was 12.4% of the economy.